Geraline writes: I read your “How to type with a swipe” article. I had an Android phone that came with Gesture Typing, but I’ve today been given another Android phone, and it doesn’t have that. I’ve downloaded third-party keyboards SwiftKey and Swype, but on clicking on them, they each asked permission to capture sensitive information like passwords etc. So I thought, WTF!? and promptly said no. I loved Gesture Typing, I could type almost as fast as a teenager!! I’m feeling really bummed now!! 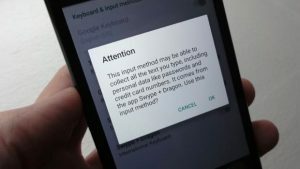 Both Android and iOS devices will give you a privacy warning before installing a third-party keyboard like SwiftKey or Swype. Hi Geraline! I completely understand your hesitation to install any Android or iOS app that warns that it can access everything you type, including email addresses, credit card numbers, and even passwords. But should you let that stop you from using third-party keyboards or “gesture typing” apps like Swype and SwiftKey? The makers of Swype, SwiftKey, Flesky and other third-party keyboard apps swear that they’re only interested in scanning your typed words so they can better predict your next words. The better they know your typing habits, they say, the more precise their predictions will be. Oftentimes, apps like Swype and SwiftKey will ask if they can send your “usage data” (encrypted and anonymized) to their servers and add your data to a giant pool of data from other users, all in the interest of boosting the accuracy of their predictions. 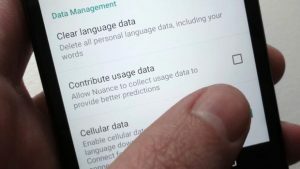 Even if you opt-out of such “share my usage data” options, your Android or iOS device will still dutifully warn you that you’re essentially letting a third-party app take a peek at everything you type. If you’re paranoid about trusting a third-party keyboard with your personal data, you can always opt out of any “share my data usage” options. So, should you be worried? The answer: it depends on who you trust. 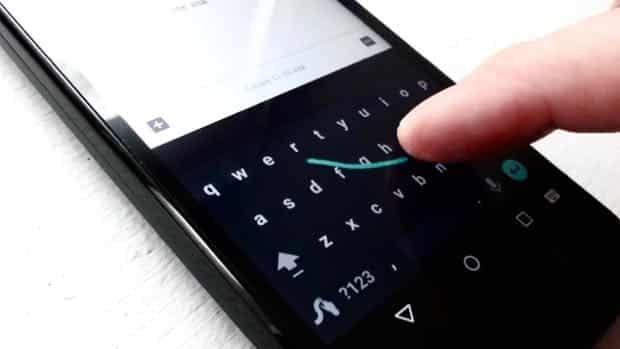 Swype, Swifty and most reputable third-party keyboard makers promise that they’re not reading your texts nor otherwise watching your keystrokes. This TechCrunch post does a nice job of summarizing the privacy policies of the biggest third-party keyboard developers, with most of them noting that their keyboards are specifically designed to ignore sensitive data like passwords and credit card numbers. If you’re feeling paranoid, you can always scour the settings of any third-party keyboard you install and make sure to “opt-out” of “share my usage data” or cloud-connectivity options. 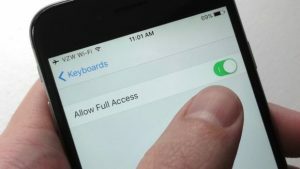 Just disable to “Allow Full Access” setting to keep a third-party keyboard for iOS from phoning home. OK, but where does that leave us? Well, that’s up to you. Personally, I’ve decided to go ahead and trust that Skype, SwiftKey and the like will protect my usage data and look away when I type my passwords. But in the end, you’ll need to make your own decision. If you’re in doubt, don’t tap the “Install” button. Hope that helps, Geraline. Still have questions? Let me know!